I went to Pepperdine and lived in Santa Monica. In order to get to school you have to take PCH, which is the worst highway in America. There is always traffic and there is no way around it. I’d pick up Mexican food before class, and I’d end up eating it in my car most of the time. Usually I’d just rest the burrito in the front armrest compartment thing. Obviously, I’ve been doing it all wrong. This is the greatest thing ever. Prior to December 2013, the majority of Los Angeles had no idea who he was. And unless you hang tight with the Lakers or the NBA, you still may not recognize his name. The Lakers pulled up Kendall Marshall from the D-League this past season after the point guards on their roster began dropping like flies to injuries. Marshall held his own on the staggering squad, finishing with an average of 8 points, 8.8 assists and 2.9 rebounds per game, according to NBA stats. In the Lakers Kobe-less stretch, Nick Young stole the show on the court, claiming the nickname Swaggy P and becoming notorious for his shot celebrations. 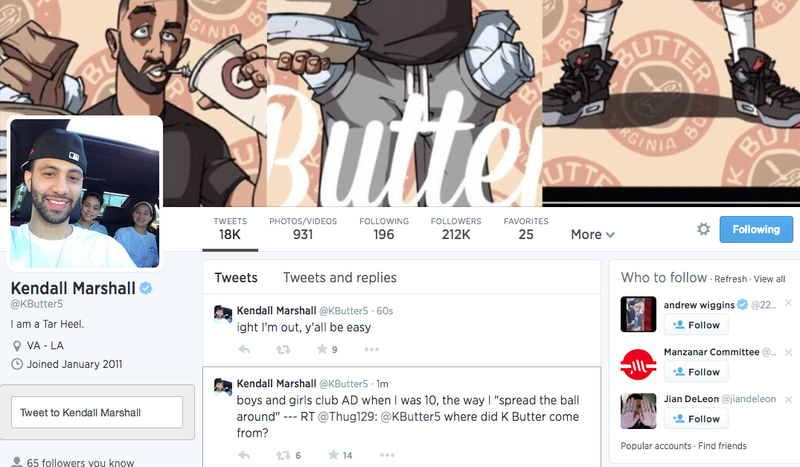 However, Marshall was able to build a following with his off the court personality — @KButter5 reigns supreme. Marshall’s follower count on Twitter trumps every Laker on the 2013-14 roster with the only exceptions being All-Stars Kobe Bryant, Steve Nash and Pau Gasol. His Q&As, fast food cravings and comedic comments have garnered an audience. As everyone has said since Twitter took off, it provides a platform for athletes and celebrities to connect with fans like never before. Marshall has mastered it. Scroll through his feed and it’s immediately apparent that he leaves up no walls between him and the world. I'm not puttin my ball in an overhead compartment. she's stayin with me, stop askin lady. He’s for real and his social media reach doesn’t even stop at the blue bird. You can also join his 36.6K Vine followers to follow his life in six second bursts, most of which feature him singing or lip-syncing. Or if you’re more into photos, of course he is on Instagram as @jethrowellington to the tune of an audience of 102K. Third 2014 draft pick Joel-Hans Embiid has made noise on Twitter lately with his failed attempt to sway LeBron James to choose his team in Philly. And his most recent tweet at Kim Kardashian (he quickly apologized). Yet Embiid’s wild antics still don’t quite bring him to the threshold of @KButter5’s 212K. Until then, he is worth keeping tabs on. You will be entertained.